Never underestimate the debilitating effects of mouth sores! Pain in your mouth, while they may be measurably small in size, are magnified exponentially during cancer treatments. These little mouth sores must be treated gently and gingerly. Mouth sores are an often reported and highly painful side effect of cancer and chemotherapy treatment. 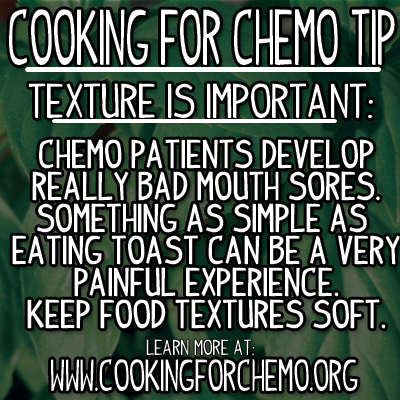 Mouth sores can be unavoidable as the chemotherapy begins to break down the softer tissues in your body. However, there are some good cooking techniques and tips to make certain that we don’t exacerbate the problem when eating during cancer and chemotherapy treatment. While it may be soothing to your throat to drink a nice hot cup of tea or broth, hot liquids can make mouth sores worse by burning the already irritated skin. This will set the healing process back and make it more difficult for your mouth sores to heal quickly. While I strongly espouse the use of spicy flavors in cooking, when you have mouth sores you want to be very careful with the amount of spiciness that you ingest during cancer and chemotherapy treatment. A touch of spice will naturally warm up a dish. However, if you add too much spicy, the burning sensation that spicy seasonings naturally impart in your food will physically burn the open sores in your mouth. This is not something you want, especially when dealing with all the other numerous cancer side-effects that occur. A quick tip to combat spicy flavors is to utilize vinegar to help cool down the spiciness of a recipe. Dry foods like crackers, cookies, chips, and pretzels may taste delicious, but when you have mouth sores, they can be your worst enemy. The abrasive textures and rough edges of these foods can actually rub your mouth sores raw and make them worse, sometimes leading to inadvertent bleeding! You want to always ensure that all the foods you are eating are soft in texture while you have mouth sores. And while a nice toasted sub sandwich will sound amazing, the fall out from eating such a rough substance is sure to leave you in a raw situation. Use care when ingesting caffeine, salt, and acidic foods and liquids. While a nice cup of tea or your favorite cola drink may sound refreshing, the high acidity and caffeine can actually leave you more dehydrated than when you started. Salt, while it has many rehydrating properties, can actually dry out your mouth if it is taken in excessive quantities. Make certain to drink lots of fluids during cancer and chemotherapy treatment. Don’t make it difficult for your mouth to get hydration the most logical way, which is of course by ingestion. If possible, frequently sip water and rinse it around your mouth before swallowing. During my mother’s cancer treatments, I would physically hold a cup of water with a straw for her to sip every hour to ensure she stayed properly hydrated. You can also try an over the counter dry mouth rinse. Many oncologists will recommend a dry mouth rise for those with chronic dry mouth. These can help, but are not an end-all-beat-all solution to ending dry mouth. Keeping these things in mind and applying the Cooking for Chemo …and After! techniques to your cooking will definitely help with mouth sores. If you have a favorite technique to help with your mouth sores, we’d love to hear from you! 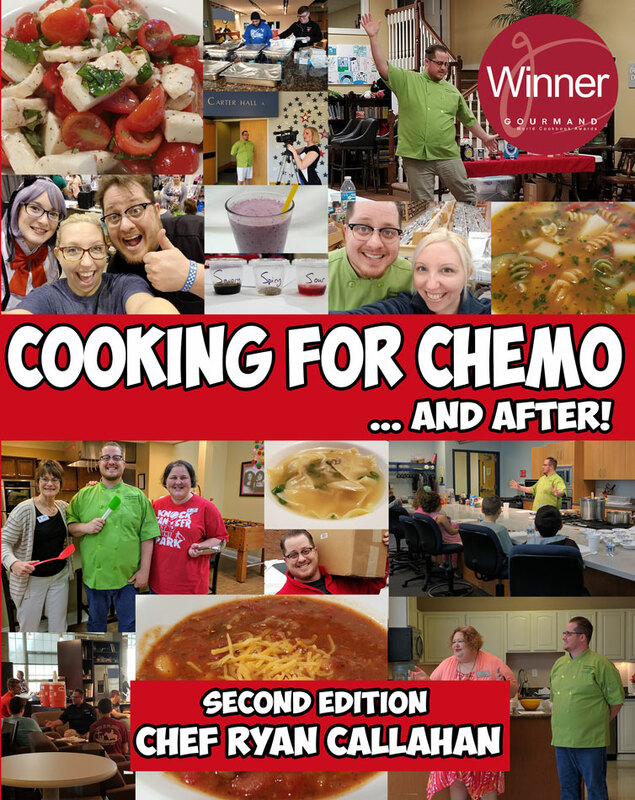 For more information on how to cook for cancer patients going through chemotherapy, you can purchase Cooking for Chemo …and After! by going to Amazon or Barnes and Noble.